As your prototypical girl from Queens, I've spent many nights in Atlantic City. Sometimes with my parents or family friends, sometimes with the unsavory characters that have graced my life. Often times booze was involved. I know the Borgata well. 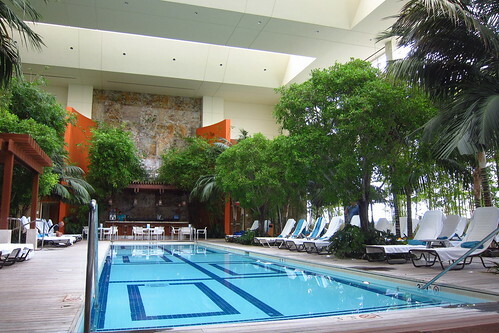 But their newer (to me) hotel, The Water Club, that was fancy. I'd never been there. So when offered to stay there for three days, I said yes. It's been a long summer. There were promises of a massage, room service, and copious amounts of food! One of the Borgata's selling points is the food. They have restaurants from Bobby Flay, Wolfgang Puck, and Micheal Mina, as well as an Old Homestead. Our visit was to include a dinner at Fornelleto, their casual Italian place headed up by Le Cirque alum Stephen Kalt. It was a multiple course meal where we tasted a better portion of their menu. 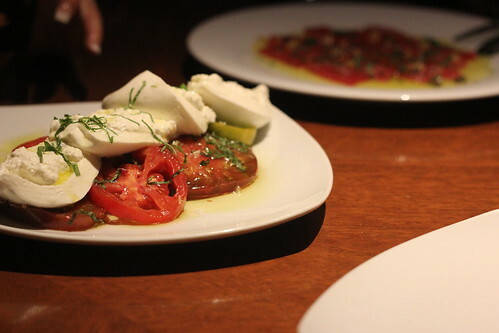 One of the highlights was sliced heirloom tomatoes topped with fresh mozzarella and burrata. Simple, delicious, and perfect for a late summer meal. 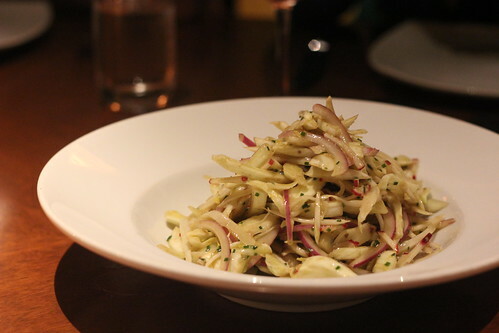 Another highlight, for me at least, a person who's intake of vegetables has severely decreased during the height of vegetable season, was their Fennel, Endive, and Red Onion Salad. I don't usually eat fancy vegetables like fennel or endives, so imagine my surprise when I began going after seconds. And thirds. I filled up too much on the savory courses that I broke my own personal rule of "leave room for dessert." I struggled to eat a bit off each plate: apple crostata, panna cotta with goat cheese gelato, a corn gelato with sweet corn foam, and this dark chocolate budino. 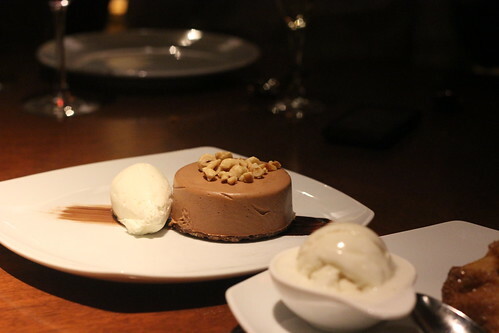 Budino is simply Italian for pudding, and this was as creamy and silky as panna cotta. Of course the addition of Nutella, a hazelnut butter crunch, and mascarpone cream didn't hurt. 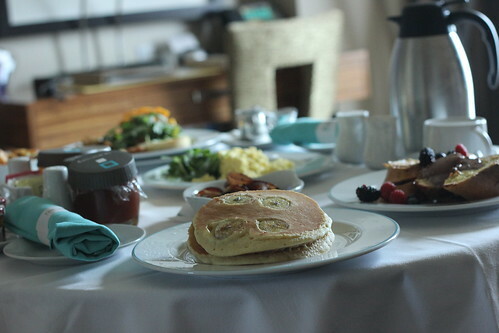 That first night, there was a good amount of boozing, so the next morning a bit of room service and a breakfast buffet were in order. Then the massage--why has no one told me about the wonderfulness that is a full body massage?! Then pooling. The place is filled with five pools, inside and out. One of my personal favorite things to do is visiting AC in the dead of winter, when you can hang in an airy heated pool area while the cold winds howl outside. Dinner on the second night was at Michael Mina's place, Seablue. It's a seafood-based restaurant, fitting for an ocean-side city. Our meal consisted of lobster with American caviar followed by a perfectly cooked Moroccan Octopus Tagine. Few things in my life are as enjoyable as meaty octopus. 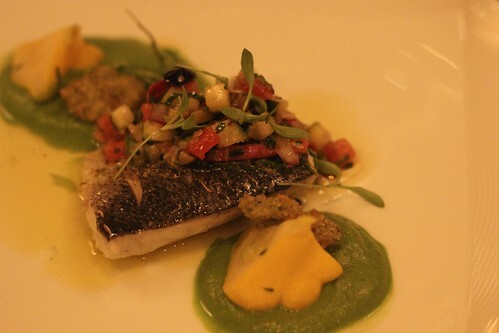 The third course was Herb-Poached Loup de Mer with a zucchini pistou. And I remembered why I don't make fish at home. It's never this good, ever. Our final morning there was greeted with two wicked hangovers. Ding, ding, room service. A cart full of food was in our room within 30 minutes--french toast, eggs, bacon, juices, a beautifully large pot of coffee. 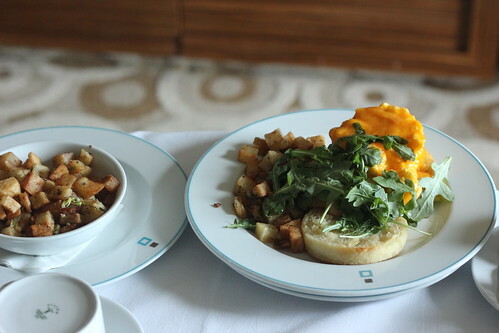 Room service is one of the best things ever. Also, the chef behind The Water Club's room service menu is Chef Geoffrey Zakarian. It had the typical room service flaw of everything's a bit lukewarm, but we didn't care. It was all delicious. For more information on The Borgata, click here. Whether you enjoy the dense texture of a basic fudgy brownie or the ooey-gooeyness of cake-like versions frosted to creamy perfection, brownies do the trick when you want a fast-to-fix snack or dessert that's oh, so delicious. That pool looks phenomenal. I love the design and the atmosphere that the room give. It just makes you want to dive in and spend all day relaxing in it. I have a friend that has an outdoor pool, it's pretty great because his home is positioned so that you don't get the furious rays of the sun in the afternoon, He is pretty modest with it but he wouldn't share with me where he got his decor, what he did tell me is that he got his remarkable glass pool fencing in Perth. I wonder if the pools there have retractable pool covers. The picture doesn't seem to show that they do. The ambiance of the pool area is perfect for relaxation. Looking at it makes me spend my money on a backyard jacuzzi. But since my favorite aunt resides only three blocks away, I'll just stick to their pool instead. By the way, they also had their pool fencing in Perth too!